Nuremberg, May 29, 2018 – Siemens brings new versions of Industrial Ethernet switches onto the market. The firmware functions (Profinet S2 device, H-Sync and configuration in Run/CiR/H-CiR) in interaction with the Simatic PCS 7 process control system make the new products suitable for the flexible, reliable and high-performance networking of process automation devices. They support system-wide diagnostics, configuration changes and plant expansions during operations as well as the construction of redundant networks to improve reliability. properties required in the process industry: lacquered PCBs (conformal coating), extended temperature range (-40 to +70 degrees Celsius), installation altitude up to 4000 meters and conformity with Namur NE 21. Special bus adapters, such as the BA 2xRJ45VD HA, allow existing Profibus cable infrastructures to continue to be used, and Profinet devices can be connected to the Profibus network from a distance of up to 1000 meters without additional amplifiers. The Scalance XF204-2BA switch has a flat type of construction and versatile bus adapters for a flexible network structure with copper or fiber-optic cables. Scalance XF204-2BA DNA Y-switches also have a flat type of construction and are suitable for connecting Profinet S2 devices to a redundant controller (AS) as an R1 system. Bus adapters support a flexible network structure. The gigabit-capable Scalance XC-200EEC switch is used as a service bridge for protected access from a system bus to a field bus, for the construction of structured networks in the field area with line, ring or star topologies, and for connecting multiple electrical or optical Profinet devices. The gigabit-capable Scalance XP-200EEC switch is suitable through its high IP65 degree of protection and rugged M12 connector system for cabinet-free use and for supplying PoE-capable terminal devices, such as IP cameras. 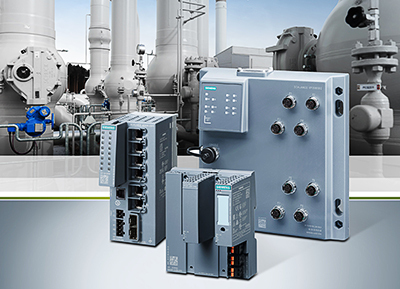 Siemens brings new versions of Industrial Ethernet switches onto the market. The firmware functions in interaction with the Simatic PCS 7 process control system make the new products suitable for the flexible, reliable and high-performance networking of process automation devices.